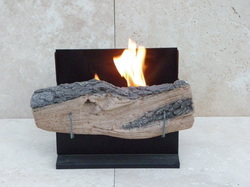 These Fire Burners are the perfect way to enjoy the comfort and benefits of an open hearth without the expense, space and impact on the environment. Unlike traditional heating units, our products are very simple to handle, portable and environmentally friendly. Select an image below for more information and pricing. Convert your unused fireplace - simply place inside - no need for working chimney. Place the approved tin in the Fire Burner - then position the ring on top so it sits firmly. Use a long match or BBQ lighter to light the fuel. NEVER use a match or normal lighter as the fuel can ignite quickly and it may burn. Do not place your face, hair, or loose clothing over the Fire Burner. To see if the fuel has ignited, wait a little bit and the flame will appear. 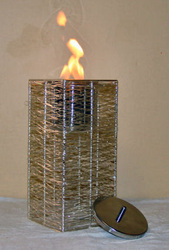 Sometimes it is hard to see the flame straight away. Do not move the Fire Burner when it is in use. ALWAYS position the Fire Burner before lighting it. DO NOT attempt to light a canister whilst holding it in your hand. NEVER use water to extinguish the flame - Instead, simply put the lid on. While the Fire Burner doesn't emit toxic fumes, it does require oxygen to burn - this means you should always have a window open to maintain a healthy level of oxygen to breathe. 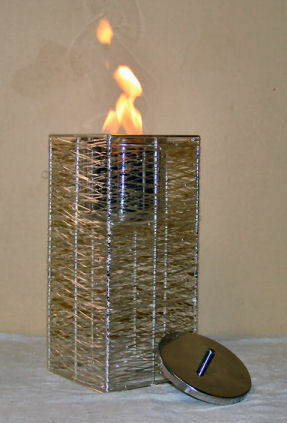 Keep Fire Burners away from curtains, and other flammable materials. 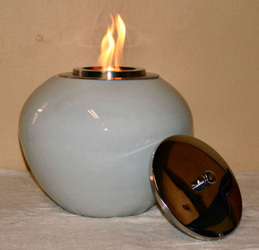 Ensure the Fire Burner is in a position where it cannot be easily knocked over. Place the lid over the flames approaching from the side of the Fire Burner (not from the top). Wait 20 minutes to make sure the fire rind and canister is cool enough to handle comfortably before removing. Do not store in a warm place or near anything that emits heat. What is the Fire Burner powered by? 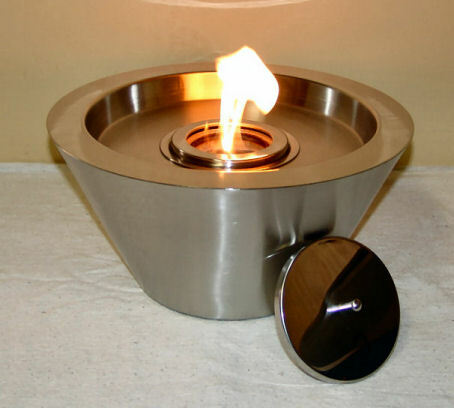 Fire Burners are powered by denatured ethanol, which is sold under various trade names (bio-alcohol, stove fuel, and methylated spirits), sold at petrol stations, Mitre10, Bunnings and at some supermarkets and on the internet. No. The Combustion is totally clean and sootless. Only small amounts of carbon dioxide and water vapors are formed. No, because the combustion is sootless. How much heat does it give out? The heat comes immediately and is directed outwards, not lost up a chimney. 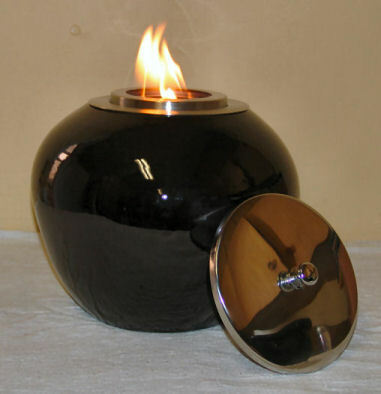 The Fire Burner is able to warm a room of normal size. Can I use it indoors or outdoors? Since the Fire Burner is chimney free, it can be placed in any room, regardless of whether it is an apartment or a home in a cottage, or public premises. The product is intended for both indoor and outdoor use. Be sure to take normal fire safety measures to prevent accidents and injury. See our safety info below. 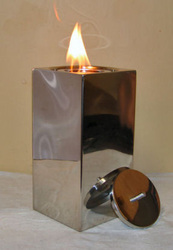 Is it environmentally friendly to heat with a Fire Burner? Yes. Because choosing an ethanol powered Fire Burner from our range means that you employ modern technology, and modern fuels that are sustainable and safe. Denatured ethanol is produced by fermentation of renewable raw materials such as wheat, barley and corn. Ethanol (methylated spirits) is biodegradable. What happens when the canister inside rusts? It is normal for the canisters to eventually rust. This will not interfere with the fire burners performance. We also stock replacement canisters if you need them.